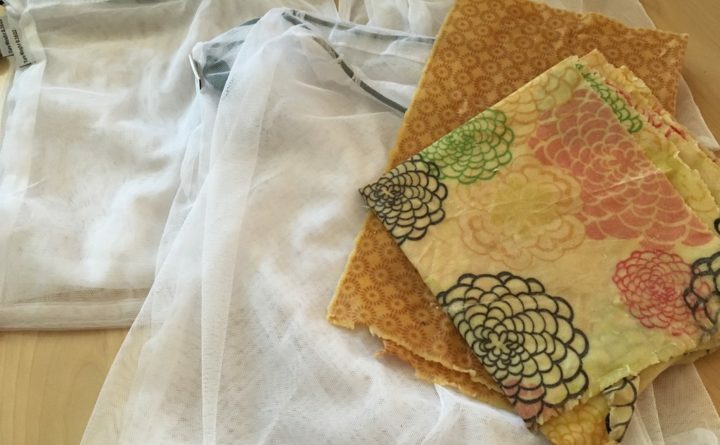 Reusable food wrap made of beeswax and reusable mesh produce bags make it a bit easier being green. Dedham’s curbside recycling program ended last year because of rising costs, but Kristin Beauchamp calls it a “blessing in disguise.” Beauchamp, the owner and operator of Lone Spruce Farm in Dedham and the leader of 4-H Club “Spruced Up Homesteaders,” saw a silver lining in an otherwise disappointing turn of events. “Our consumerism became highlighted. … Just the physical act of throwing a glass jar in the wastebasket felt so counterintuitive, painful even, that it became apparent our real problem was not the disposal of but rather the consumption of single-use packaging,” Beauchamp said. Even though Beauchamp’s family and business were already highly efficient, she realized the need to address recycling after the loss of the recycling program in Dedham. “As a business, we began seeking more bulk options, trading labeled bags for stamped paper bags, and sourcing every supply we need as locally as possible. We use linen bags when purchasing produce and reject products packed in plastic as much as possible,” Beauchamp said. The Beauchamps are among the growing number of Maine residents who live in smaller communities, such as Eddington, Holden and Dedham, where recycling programs have changed or ended in the past year. Rising costs of recycling coupled with a reduced market for the recycled materials has resulted in towns making tough decisions about their recycling programs. China, formerly the biggest purchaser of America’s scraps, raised its standards on importing recycling material and banned many recycled materials it has previously purchased from the U.S. When China purchased recycled materials, recycling programs could make money to offset costs, but when China quit buying in 2018, recycling programs lost revenues from sales to China, making the programs too costly to keep up for many small communities. Still, China’s shift is not the only cause for the loss of many smaller recycling programs. Many Americans do not clean their recycled materials and even sometimes include materials that are not recyclable in their recycle bins. Things like greasy pizza boxes in the recycling bins means that someone needs to sort through recyclables, adding costs to recycling programs. JJ Starwalker is the vice president of the Penobscot County Chapter of the Maine Organic Farmers and Gardeners Association and the owner and artist behind Dutch Hex Sign, a local folk art company. In the 1960s, she was a part of the initial push toward recycling in the U.S. She has been excited to see the way recycling has taken hold and become such an important part of our culture. However, she said she has had concerns about the nature of recycling in the U.S.
“Recycling success in the large economy has always been dependent on marketability of the individual materials, which has always had peaks and valleys. It saddens me greatly, now, that the single-stream recycling [a system where all recycling materials are collected together instead of separately] has been so badly compromised by contaminants and materials that were never meant to be recycled, that the entire system is at risk,” Starwalker said. “Though the recycling message has come through the years loud and clear, the idea of actually reducing the amount of waste we generate — whether we can recycle it or not — appears to have mostly fallen on deaf ears,” Starwalker said. Indeed, there is more we can do to make a difference. According to the United States Environmental Protection Agency, “Making a new product requires a lot of materials and energy.” Therefore, the best way to conserve natural resources and protect the environment is to reduce and reuse what you buy. Reducing and reusing can also save you money, so taking proactive steps toward reducing and reusing helps both the planet and your pocketbook. Those who are hoping to reduce their impact on the planet can find ways to simply reduce the amount of packaging materials they acquire. — Purchase in bulk or large-sized items as much as possible. Shopping this way means you get more of the product with overall less packaging. Of course, you want to be careful to make sure you can use the food items you buy in large quantities before they spoil. At the Natural Living Center in Bangor, for example, you can purchase a wide variety of items including beans, flour, and dried berries from the bulk bins in the quantities you need. — Look for items without any packaging. For example, fresh fruits and vegetables are usually not in packages. Also, if you bring a reusable bag, which you can make yourself or purchase from the maker community Etsy.com, to the grocery store for produce items, you won’t need even the thin plastic bags for produce that grocery stores offer. — Use cloth napkins and dish towels. While paper napkins and paper towels have become the norm, using cloth means there’s no paper to be tossed. — Send formal requests to keep junk mail and catalogs from being sent to your home. Some nonprofit organizations run websites to help you in this endeavor. Sites such as catalogchoice.org offer options for stopping catalogs from being delivered to your home. — Repair your items as much as possible, instead of buying new ones. For example, you can patch a hole in your winter coat or darn your socks. If you do not know how to darn socks, there are helpful YouTube videos that provide instructions. — Invest in reusable bags for your shopping. And, if you forget your bags, carry your items out without bags. Doing so will help you remember next time, and you won’t bring unnecessary shopping bags into your home. — Buy reusable items instead of disposable items. For example, you can avoid plastic silverware by just using your normal silverware in your lunch pack. You can also buy items such as metal straws and canvas snack bags for lunches or snacks. These items may cost more up front but will save money and the environment in the long run. — Look for ways to repurpose items you already have. Glass jars are wonderful items to reuse for both storage and crafts. For example, glass jars can be used to store everything from leftovers and spices to buttons. They can also be used in a wide variety of crafting activities for children and adults. Glass jars make great candle holders and vases and can be decorated by children and used for things like piggy banks and note holders. Ultimately, losing access to recycling provides us with an important opportunity to reflect on the ways we shop and what we bring into our home. And, while recycling is an important part of caring for our planet and its resources, reducing and reusing what we buy has an even bigger impact on the planet.